Pierre Lallement (born between August 30, 1843 and August 29, 1844; died August 29, 1891), is considered by some to be the inventor of the bicycle. As a 19-year-old maker of baby carriages in Nancy, France in 1862, Lallement saw someone ride by on a dandy horse. Rather than build one of his own, he added a transmission comprising a rotary crank mechanism and pedals attached to the front-wheel hub, thus creating, allegedly, the first true bicycle. He moved to Paris in 1863, apparently interacted with the Olivier Brothers, who saw great commercial potential in his invention. 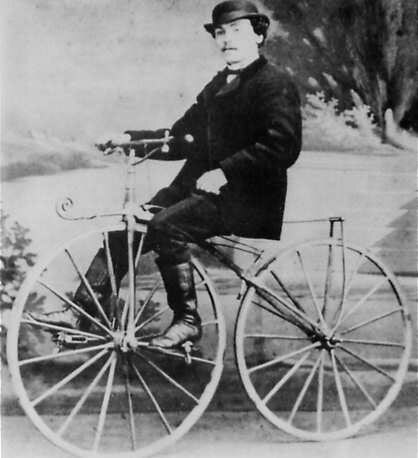 The Oliviers formed a partnership with Pierre Michaux to mass-produce a 2-wheeled velocipede. Some claim they produce after Lallement's design in 1864, some claim after Ernest Michaux design. Lallement himself apparently become an employee of Michaux for a short time. 1865 Lallement left France in July 1865 for America, settling in Ansonia, Connecticut, where he built and demonstrated an improved version of his bicycle. 1866 April. He filed a patent (No. 59,915) for the pedal-bicycle, the patent being awarded on November 20, 1866. My patent consists in the arrangement of two wheels, the one directly in front of the other, combined with a mechanism for driving the wheels, and an arrangement for guiding, which arrangement also enables the rider to balance himself upon two wheels. His patent drawing shows a machine bearing a great resemblance to the style of dandy-horse built by Denis Johnson of London, with its serpentine frame, the only differences being the addition of the pedals and cranks, and a thin strip of iron above the frame acting as a spring upon which he mounted the saddle, to provide a more comfortable ride. 1868 Failing to interest an American manufacturer in producing his machine, Lallement returned to Paris in 1868, just as the Michaux bicycles were creating the first bicycle craze in France, an enthusiasm which spread to the rest of Europe and to America. Lallement returned to America again sometime before 1880, which was the date of a patent infringement suit where he testified on behalf of plaintiff Albert Pope, who had bought his patent. Lallement was living in Brooklyn and working as Pope's employee. He died in obscurity in 1891 in Boston at age 47. This page was last edited on 6 March 2012, at 10:06.